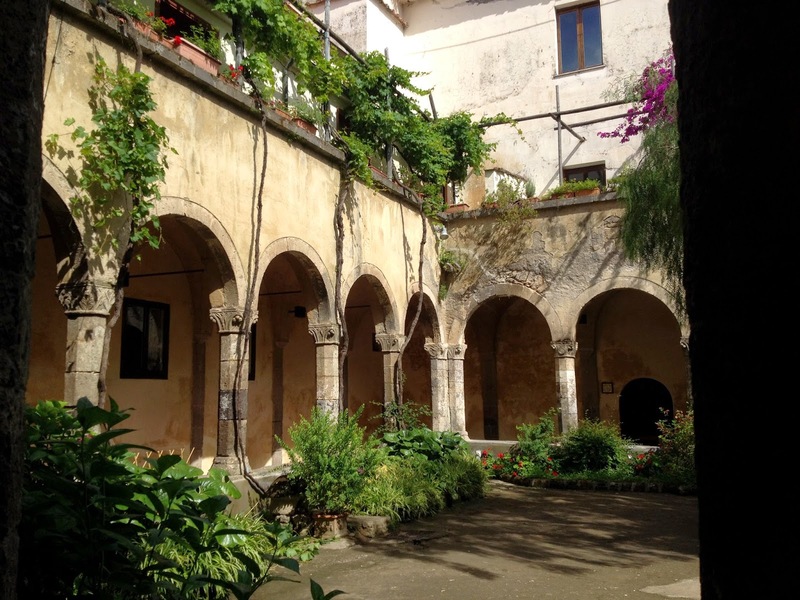 It is hard to imagine a more idyllic setting for a wedding than il Chiostro di San Francesco, a beautiful 14th century cloistered area just a short walk from the centre of Sorrento in Piazza Gargiulo. 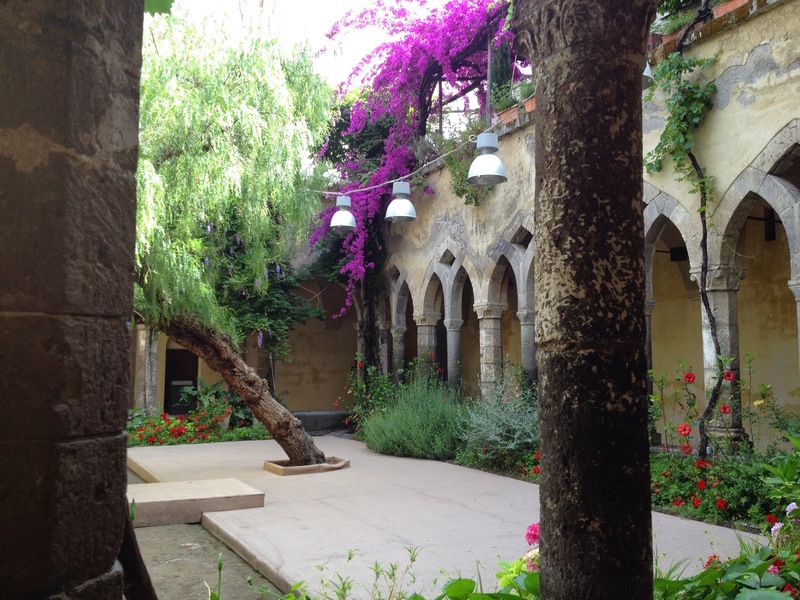 The cloisters are next to the baroque church of San Francesco and close to gardens with trees and abundant bougainvillea well away from the main road and the traffic. It is one of the most peaceful parts of Sorrento and the rectangular open area in the middle provides an ideal space for seating the wedding guests. The adjacent garden, known as Villa Communale, has a terrace with a panoramic view over the bay of Naples making it a perfect backdrop for wedding photographs after the ceremony. On a sunny day, surrounded by the intense colour and fragrance of the flowers and within sight of the sea, it is a magical place for couples to make their vows. As well as wedding ceremonies, the cloisters are sometimes used for art exhibitions and concerts during the summer. They were built in the 14th century on the site of a seventh century monastery and are one of the oldest monuments in Sorrento that can still be visited today. The cloisters represent a fusion of architectural styles featuring two different types of arches as can be seen from the two pictures shown here. For more information about holding a civil wedding ceremony at il Chiostro di San Francesco contact il Comune di Sorrento, whose offices are in nearby Piazza Sant’Antonino. Alternatively, couples can engage the services of a wedding planner based in the resort who will sort out all the paperwork and provide translation services for them. There are many good restaurants within walking distance that could provide a superb meal for your guests after the ceremony to round off the day. 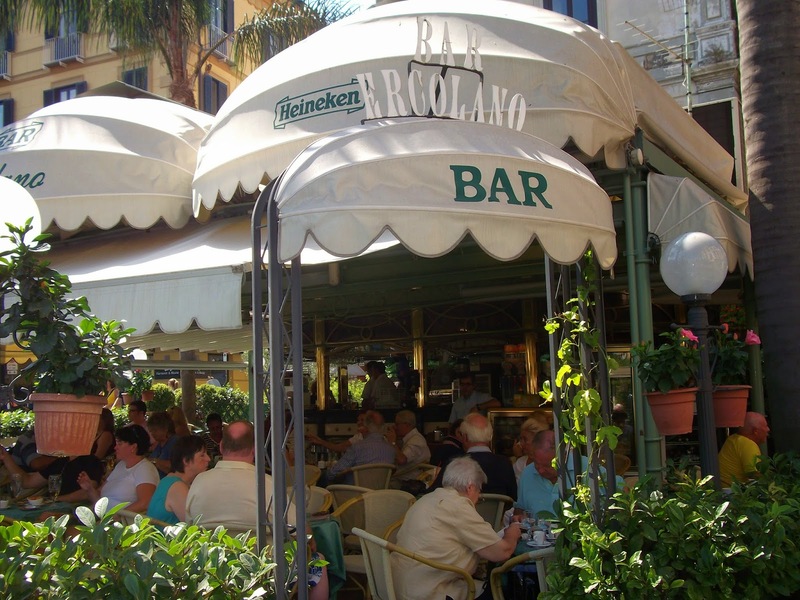 At the heart of all the action in the middle of Sorrento, Bar Ercolano is open from early in the morning till late at night and is a great place to visit for a drink or a snack. Sheltered under awnings at one end of Piazza Torquato Tasso, Bar Ercolano serves, coffee, wine, beer, ice-cream and a good range of snacks. You get fast and efficient service from the waiters and complimentary nibbles are served with your drinks. Although there is only a small, green hedge separating the bar from the swirling traffic, it is still a pleasant place to sit and relax when taking a break from shopping and sightseeing. Many visitors have posted reviews on the internet praising the coffee at Bar Ercolano and recommending it as a great place for people watching. There is a long history of a bar on this spot. In the 1904 edition of Italy from the Alps to Naples by Karl Baedeker there is a listing for 'Caffe-Birreria Ercolano, Piazza Tasso, opposite the Circolo (club)'. Bar Ercolano is as much a Sorrento institution as the statue of the poet Torquato Tasso, which is in the garden area opposite, and is a venue for refreshments not to be missed during your holiday. The long, tiring climb uphill from the port or beach is a thing of the past for Sorrento visitors and residents. Two lifts now connect the centre of town with Marina Piccola and the nearby beaches. Travellers returning from a day trip to Capri, Ischia or Naples can be whisked up from the port to Piazza Gargiulo in the Villa Communale in 20 seconds. From there it is just a few minutes walk to Piazza Tasso and the shops, bars, restaurants and hotels in the centre of the resort. A single trip costs 1 euro but you can also buy a return ticket for 1.80. Between May and September the lift runs from 7.30 in the morning till midnight. 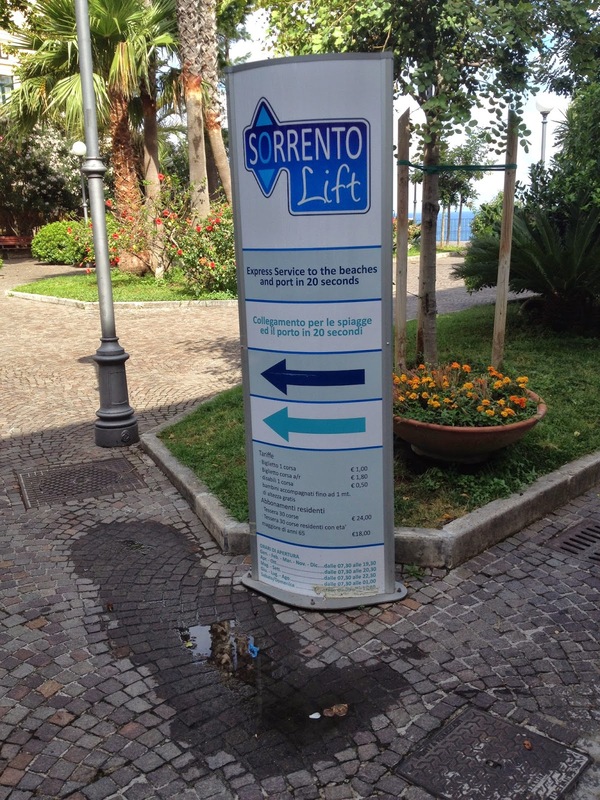 For more information visit www.sorrentolift.it. A new crime novel with an Italian setting has just been published on Amazon. The novel is the first in a series featuring detective duo Kate Butler, a freelance journalist, and Steve Bartorelli, a retired Detective Chief Inspector who is of Italian descent. His father’s family are from a village just outside Sorrento. 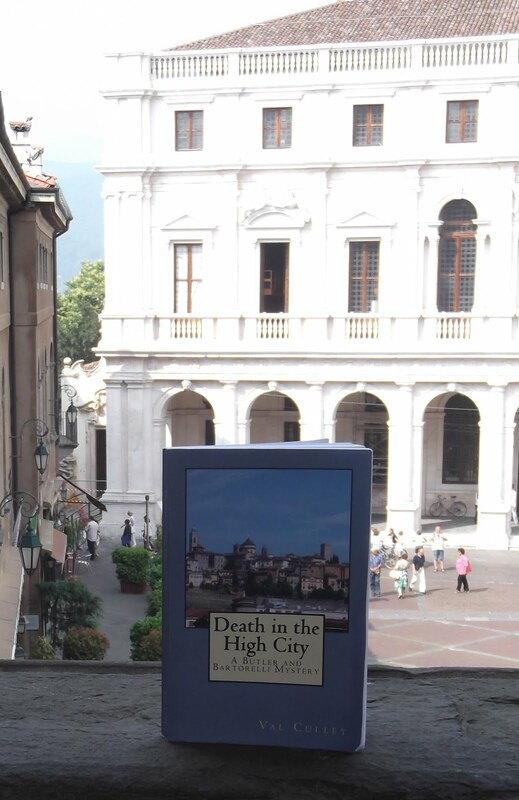 Believed to be the first British crime novel to put the spotlight on Bergamo in Lombardia, Death in the High City centres on the investigation into the death of an English woman who was writing a biography of the composer Gaetano Donizetti. Of interest to anyone who enjoys the cosy crime fiction genre or likes detective novels with an Italian setting, the book is currently available as a Kindle edition, but can also be read on smartphones, tablets and computers using Amazon’s free Kindle app. The dead woman had been living in an apartment in Bergamo’s Città Alta and much of the action takes place within the walls of the high city. The local police do not believe there is enough evidence to open a murder inquiry so Kate Butler, who is the victim’s cousin, arrives on the scene to try to get some answers about her cousin’s death. Kate visits many of the places in Bergamo with Donizetti connections and her enquiries even take her out to the beautiful Lago d’Iseo. But after her own life is threatened and there has been another death in the Città Alta, her lover, Steve Bartorelli, joins her to help her unravel the mystery and trap the killer. The reader is able to go along for the ride and enjoy the wonderful architecture and scenery of Bergamo and the surrounding area while savouring the many descriptions in the novel of the local food and wine. Death in the High City by Val Culley was published in May, 2014 and is now available on Amazon. If you would like a beautiful memento of your holiday in Sorrento, why not treat yourself to an article made from inlaid wood. Intarsia, the craft of inlaying a decorative, design in wood, is an ancient Sorrentine tradition. You will see wonderful old examples of this type of marquetry work illustrating religious subjects inside Sorrento’s Duomo in Corso Italia. 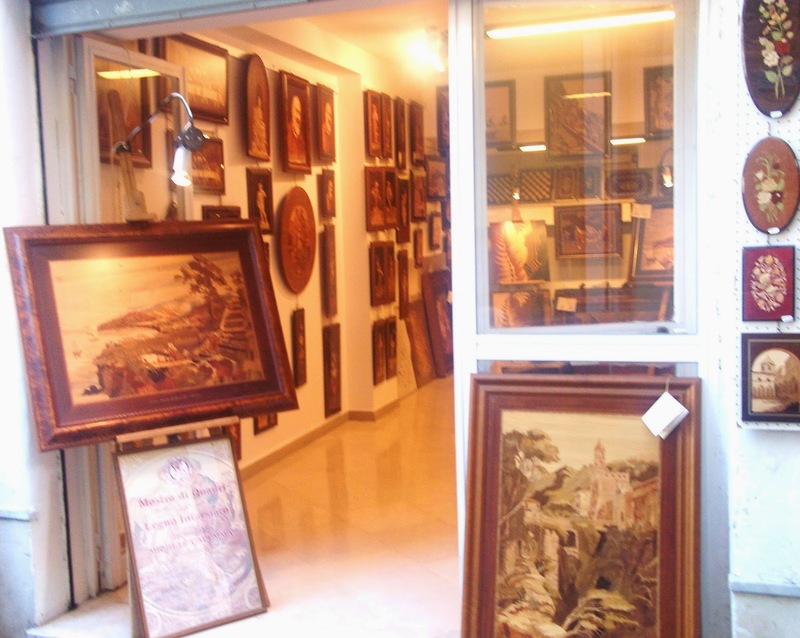 If you wander along Via San Cesareo, the ancient street that runs parallel with the Corso, you will see shops selling pictures, boxes and small tables decorated with inlaid wood that have been hand-made by artisans in Sorrento. A shop specialising in objects made from inlaid wood. Turn down one of the side streets that go off Via San Cesareo at right angles and you will see the artisans at work creating these items in full view through the open doors of their workshops. 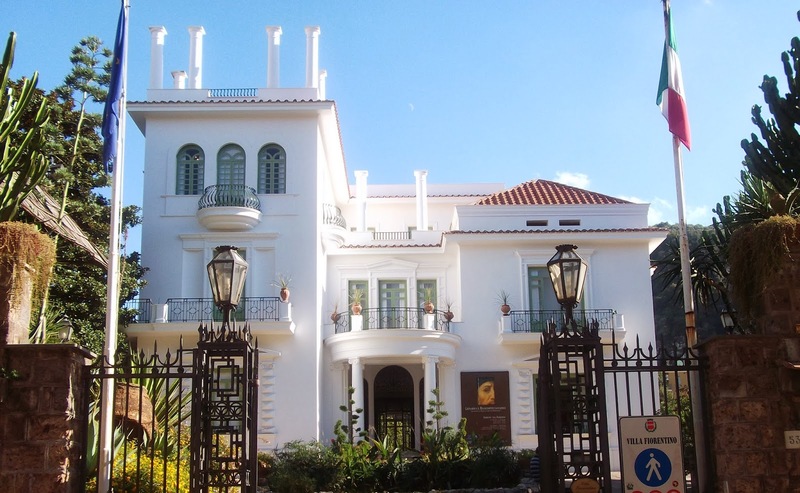 In nearby Via San Nicola you can visit il Museobottega della Tarsialignea and see precious early examples of the craft and pieces of furniture and pictures from the 18th and 19th centuries, when these items were sought after by the rich and famous people who visited Sorrento on the Grand Tour. The museum is housed in an 18th century palace, where courses and events for people wishing to learn the craft take place. The palace also has an exhibition of paintings, prints and photographs by artists from Sorrento and abroad depicting the coastline and scenery around the resort over the centuries. The museum is open Monday to Saturday from 9.30 to 13.00 and 16.00 to 20.00 between April and October. It closes an hour earlier during the winter. A stunning sight in the centre of Sorrento is the ornate façade of the Chiesa del Carmine in Corso Italia. The yellow-painted church with its white decorative features looks beautiful against the blue sky when viewed from Piazza Tasso. Chiesa del Carmine is on the left hand side at the beginning of Corso Italia going in the direction of Sant’Agnello. It is believed the church was originally built near the spot where a group of Sorrentine Christians were martyred in Roman times. The present building, which has an attached bell tower, was constructed on the site of an earlier church at the end of the 15th century. It was based on a simple design with a single nave but contains some fascinating art treasures. The church has a painting of Mary the Madonna holding the baby Jesus, believed to date from the 16th century, depicting her as dark-skinned in the style of the Vergine Bruno di Napoli, a painting of a dark-skinned Virgin Mary in Naples. There is a large ceiling painting by Onofrio Avellino depicting the Virgin Mary with Saint Simon and angels, believed to have been completed in 1710. Along with other 16th and 17th century paintings, Chiesa del Carmine is also home to two gilded, wooden containers of saints’ relics and bones which are believed to date back to the 16th century. In the centre of Sorrento, just off Corso Italia, Villa Fiorentino provides an elegant setting for cultural events and exhibitions. The villa was chosen as a residence by the Fiorentino family and completely refurbished in American style in the 1930s. During the war it became a refuge for famous people, including the tenor Benamino Gigli, who sang O Sole Mio and Torna a Surriento there in honour of Signora Fiorentino. On the death of the lady of the house, the villa with its beautiful gardens, was bequeathed to the city of Sorrento and has now become the headquarters of Fondazione Sorrento, an organisation dedicated to raising awareness of the area’s rich heritage of art and culture. Visitors to Sorrento will have the chance to take a look at the interior of Villa Fiorentino, at Corso Italia 53, during an exhibition of the works of Mario Sironi, the Italian painter and illustrator, between 21 February and 20 April, 2014 . The exhibition will be open daily from 10.00 -13.00 and 16.00 to 20.00, staying open until 21.00 on Saturdays and Sundays. For more information visit www.fondazionesorrento.com.